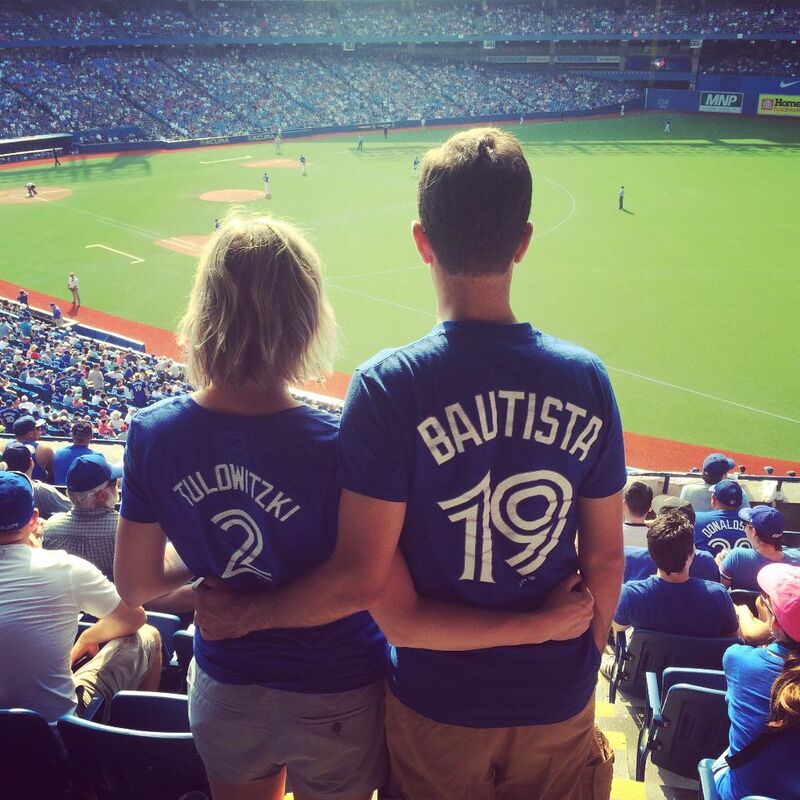 Take me out to the ball game… and then up the CN Tower. For the September long weekend the Spaniard and I flew to Toronto so that I could visit with my best buddy Jen, and well, so well he could see the centre of the universe. I think the Spaniard was expecting me to show him around Toronto, but even though I have been there multiple times, I have never been in charge of what is going on. I’ve always had friends to chill, explore, or just hang with. I picked up a Toronto travel guide from the library for some walking tour tips, and thankfully Jen took charge and sorted out a few restaurants for us to try in between our site seeing. To make The Spaniard feel right at home, we had drinks and pinxtos at Bar Raval, a newer Spanish restaurant on College st.
Toronto is a great walking city and we managed to work up an appetite as we pounded the pavement from the lake front to downtown. On Sunday we went for breakfast at one of Jen & Jord’s favourites – Lady Marmalade. The Spaniard’s baked banana bread pudding came with a bottle of Ontario maple syrup. From breakfast we headed downtown to Rogers Centre for an afternoon Toronto Blue Jays game. With the Jays in the playoff hunt the game was a sell out – we joined the masses dressed in blue and white all excited for an afternoon of beer, sunshine, and hopefully a few home runs. It was to be The Spaniard’s first ever live baseball game. My roomie and I had tried our best to explain the game but on television it is hard to see guys stealing bases or tagging up after pop flies. He was surprised when we sat down, expecting the outfield to be bigger. After just an inning he proclaimed that he understood the game (apparently Marc and I made things far too confusing). Thankfully Marc had helped my pick out my tickets a few weeks earlier – we were hidden below an overhang that shielded us from the sun. No way I could have survived 4 hours in 35 degree heat; the shade saved us all and we made it to the top of the 9th. The Jays beat the Baltimore Orioles 11 – 4 that day. On the holiday Monday we borrowed Jen’s car for a road trip to Niagara Falls. We stopped for a lovely lunch in Niagara-on-the-Lake at the Tiara Restaurant in the Queen’s Landing hotel. When we arrived in Niagara we opted for the $5 parking a little further away from the action, but the parking attendant was friendly and eager to help map out a walking tour of the falls. He sent us in the direction for the best unveiling of the area. We didn’t arrive until around 3:30 in the afternoon and yet I thought I was going to melt. With the humidity it was over 35 degrees – thankfully the falls provided a gentle mist as we walked along the promenade. There are loads of activities to choose from, but we opted for uber-toursity Hornblower boat ride that takes you right into the falls. First view is the American side of the falls. Then we headed over for a shower in the Canadian side of the falls. Someone was too cool for the raincoat – which made for a comfortable drive back to Toronto. Our last day in Toronto J & J had to work, so I said my goodbye to Jen and we set off in search of breakfast at Starving Artist – an all day waffle house. We had intentions of eating our savoury breakfast and sharing a dessert waffle, but we were stuffed. After breakfast went on a walk through Little Italy on our way to Kensington Market in Toronto. My friend Mike, who I met in Thailand in 2003, took me through the market on one of my visits to Toronto. Every time I come back I have to go to the cheese shop he took me to. This time around I found a vegan-gluten free bakery. No idea how they did it – but somehow they make a cinnamon bun without butter or eggs that tastes alright. Our last activity in Toronto was to go up the CN Tower. Going with a civil engineer meant reading all the information and you get to learn things like -the CN Tower weighs 130,000 tons which is 35x the weight of the Eiffel Tower or 23,214 elephants. When it was completed in 1976 it was the world’s tallest free-standing structure and the world’s tallest tower – records it held on to for 34 years. The views from the top were amazing, but I thought I was going to vomit watching people stand on the glass floor. Our four day trip to Toronto was filled with great food, time with great friends (thank you again J & J), smoking hot weather, engineering marvels, natural wonders, and winning baseball game. Toronto – you never get old. There is always something shiny and new to see; we will be back.